Earlier article describes what is the statement of changes in equity and how it related to FRS 101. The opening components of equity, and the increases and decreases for the year of each component. During the current year, there was an issue of ordinary shares at premium, which has increased the paid-up capital. Land was revalued and the surplus on revaluation is added to this reserve.In the event if there is any deficit arising from revaluation, the amount will reduce this reserve. 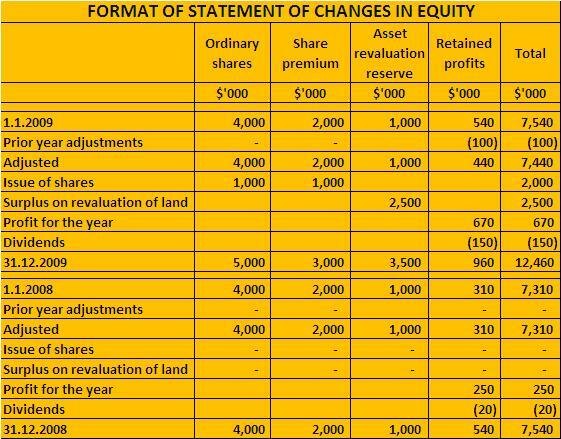 On disposal of the land, the balance remaining on this reserved will be transferred to the retained profit. The retained profits from the previous period are adjusted for any errors or changes in accounting policies that affect the previous period(s). The profit for the year is reduced by the current year’s dividend.